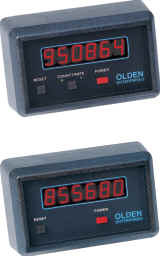 Olden Enterprises RTC (Rate & Total Count) and TC (Total Count) Counters are fully electronic with no moving parts. Both feature very large and bright LED displays. The display can easily be read from 15 feet away. being counted, which can be up to 2” away. circuitry to retain the count. There is no battery that ever needs replacement! hour. The rate function is displayed until the next push of the count/rate switch. • Counters come with a new generation sensor and standard 6” post mount. • Counter body is compact and easy to install without tools. The counters are used on folders, stitchers, and other bindery equipment, as well as various inserters, mailing machines, etc. They mount to the machine with one of four available mounts. The half-round at the end of the post slides into a matching hole in the bottom of the counter case. The post mount slides over any vertical edge up to 5/8” thick and is secured by a thumbscrew. Optional mounts: The Magnetic Base Mount features an adjustable post, which attaches with a strong magnet to a horizontal surface and has the short post that can be tilted up/down and locked in place. This allows the display to be aimed at the operator’s eyes. 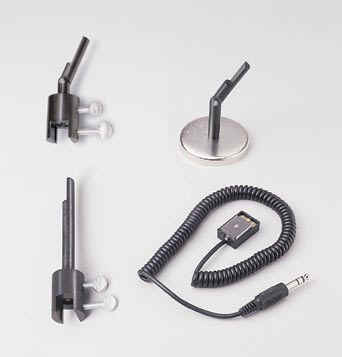 The Vertical Magnetic Base Mount (not pictured) has a straight, non-adjustable post and is designed to allow the counter to be mounted on vertical surfaces. The Adjustable Post Mount has a short post that can be tilted up/down and locked in place, aiming the display at the operator’s eyes. Sensor Size: 1.5" x 1" x .6"
Each counter is bench tested for 100 hours, and includes a one-year warranty on parts, materials and workmanship. for details on selecting the accessory package for your application.